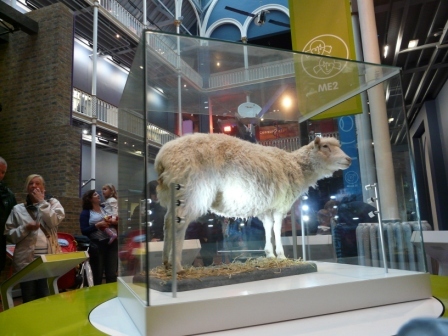 Humanity’s first successful attempt to clone a mammal from an adult cell stands on an illuminated rotating pedestal in the National Museum of Scotland. Her eyes gaze out quietly, as if at imagined pastures beyond the heads of museum visitors. All that advanced science finally comes to this: taxidermy. In the 1980s, when I was an undergraduate, I heard a lecture from one of the world’s best cell biologists. He explained why the details of mammalian cell biology and genetics would forever prevent us from cloning a mammal. A decade later, “Dolly” was born. The cell biologist was not a fool – he knew his stuff – but he underestimated our ability to penetrate what seem like solid barriers. This entry was posted in Mammals, Travels on August 11, 2011 by David George Haskell.